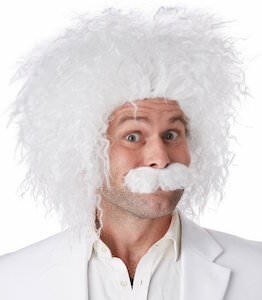 This Halloween you can look like Albert Einstein thanks to this costume set. In the set you will find a big wig with wild hair and a big moustache and that of course makes you look like a mad scientist just like Einstein and who knows maybe you do some great inventions while you are Einstein. Halloween or any other dress up occasion this is the what you need. Besides the headgear, you may choose to get a lab coat or just wear something you see Albert Einstein wear if you google his name. 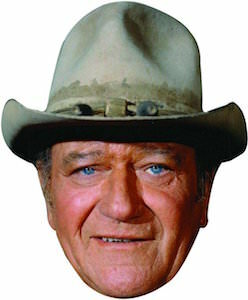 This Halloween you can look like John Wayne all thanks to this John Wayne mask. The mask is made from cardboard and is held in place by an eleastic strap. Just put on the mask and you will look like the famous cowboy that Wayne played so often complete with a hat of course. So just get a costume you like to wear and put on the mask and you are ready to be John Wayne just like everyone knows him. Now you can feel a bit more like Donald Trump by simply wearing this Trump face mask. This is a latex mask that really brings out the best out in you while you wear it. Beside the mask you just need a suit and lots of money of course and they you can pretend to be Donald Trump. 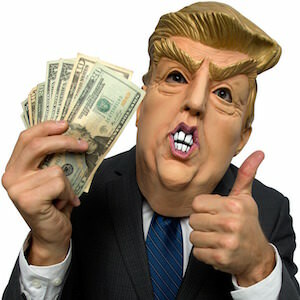 The Donald Trump mask is hold in place by elastics and has a velcro close and it keeps openings for eye’s, ears, mouth and nose so that when you look like Donald you can still interact with the world. 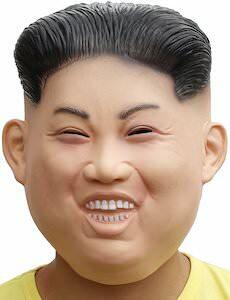 Now you can feel like Donald Trump just by putting on this mask. 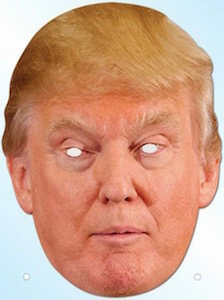 This paper mask is hold in place by string and will transform your face in to the face of Donald Trump. Of course after wearing the mask you have to start saying things that people could take the wrong way because that is what Trump seem to be doing. A mask like this is great for Halloween but also to wear to a polling station or a different political event that you attend. A paper party mask like this is great fun and will make you forget your own reality for just a little while. 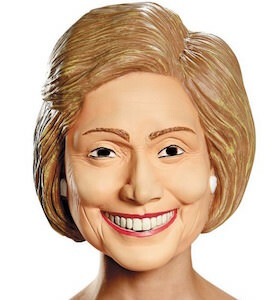 Just imagine going voting wearing this Hillary Clinton mask that will get your noticed. 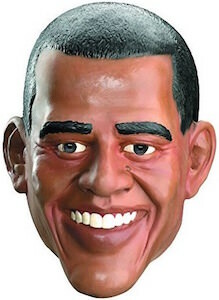 This vinyl mask will change your face into the face of the wife of former President Bill Clinton and a strong leader herself. Now you don’t have to worry what you look like because the mask of Hillary will change your looks to hers and that is great for just fun, cosplay or Halloween. Just wear the mask with a nice suit and you are ready to party like a true politician and of course that means you get noticed but so does Hillary Clinton in real life. Looking to have the best costume? Here it is, The King Elvis Presley. Is there any other costume that could beat this, I do not think so! The Elvis costume features a white jump suit with bell bottoms and high collar along with an abundance of jems and jewels that are very shiny and shaped in desigsn of crowns and eagles giving this a true Elvis Presley look. Available in a wide selection of adult sizes that range from Medium to XL and made to be durable and last you a long time and includes the jumpsuit, belt and red scarf. 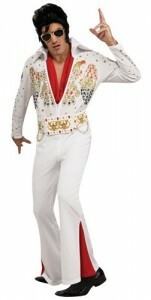 Use the Elvis costume for parties or Halloween and show off your love for The King and his music. 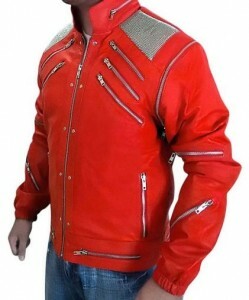 This red leather jacket is a replica of the one that you see a young Michael Jackson wearing in the music video for his hit song “Beat It”, features many silver zippers on the chest, arms and all over aswell as the silver mesh on each shoulder. Made from 100% genuine leather this jacket is not just for show, it is fully functionable, very comfortable and durable to last you a long time. It has a fully zip front and a stand up collar with two inside pockets and a durable viscose inner linning. Make this the perfect addition to complete your Halloween costume or just wear it for all occasions, it is available in a huge selection of sizes that range from XSmall to 3XL. With so many things to remember the iconic diva Marilyn Monroe from classic movies “Some Like It Hot”, “Monkey Buisness” to “The Misfits” along with countless modeling appearances there is one that will stay forever engraved in many minds. The classic white dress blown up ubove her knees from a subway vent. This costume features the very poular white dress that Marilyn wore in the 1955 film The Seven Year Itch, find a white halter top dress that is pleated and looks just like a replica. Available in a wide range of women’s sizes, just grab your favorite white high heels and a Marilyn Monroe wig and you will be set for Halloween, costume parties or a fancy night out perhaps.